After I descended from a five-hour bus ride at Buenos Aires’s Retiro bus terminal at 6:15 this morning, the ensuing taxi ride to my Palermo apartment took me through a scene of arboreal devastation. 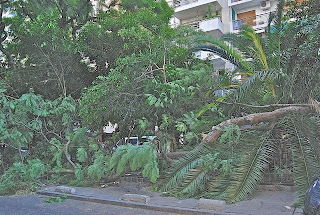 An early morning storm, with high winds, had left dozens of fallen trees and limbs, ripping some of them straight out of the soil. As of this evening, some of them are still blocking streets and sidewalks. Some 40 cars suffered damage from falling branches, at least one bicyclist was hospitalized after being hit, and the wind even lifted the roof off a large downtown gas station. In the Buenos Aires province town of Caseros, a pedestrian was electrocuted by a high-tension cable, and in some areas it was necessary to shut the electricity off for several hours. In fact, this is a predictable occurrence whenever a big storm hits the city. In part, it’s because of the near total lack of maintenance - rather than being regularly pruned, street trees here are often left to grow up to seven or eight stories, rather than being kept at a uniform height. The branches often spread out of control as well, with many weak joints that are almost certain to break under the stress of a big storm. Rotted or rotting branches and trunks are rarely removed. 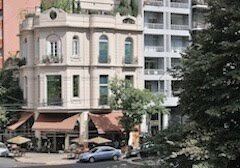 In a warming world, Buenos Aires (and all big cities) need more shade trees. But taking care of the ones they already have is at least as important - rather than just showing up with chain saws, a few days later, to clean up the mess. What a welcome back to the city! My friend Katie tipped me off to your post and I saw the Clarin article that you posted too and mentioned it on my Tree Blog post about the storm. It was quite a storm - kept us up most of the night. Where were you coming back from? I like the tree blog, Beatrice, please forgive me tardiness in replying to this. I was returning from Olavarrúa, where my in-laws live.